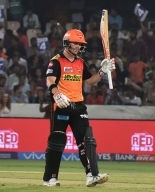 Hyderabad: Opening batsman David Warner (70 not out) and Bhuvneshwar Kumar (5/19) dazzled for Sunrisers Hyderabad as they withstood Manan Vohra's plundering 95 to pip Kings XI Punjab by five runs in an Indian Premier League (IPL) contest here on Monday. Warner's 70 not out lifted Hyderabad to 159/6 in 20 overs. In reply, opener Vohra single-handedly took Punjab on the brink of victory but his 50-ball knock, featuring nine fours and five sixes, couldn't prevent the visitors from being bowled out for 154 in 19.4 overs. Bhuvneshawar starred with the ball, getting five wickets for 19 runs in four overs to keep Punjab at bay as Hyderabad managed to end a two-match losing run at the Rajiv Gandhi International Cricket Stadium. However, Bhuvneshawar wouldn't have got the opportunity to shine had it not been for his captain Warner (70 not out; 54b; 7x4, 2x6) as the others struggled on a slow wicket. Warner shared a crucial 60-wicket stand for the fourth wicket with Naman Ojha (34 off 20 deliveries. At the start, medium pacers Mohit Sharma (2/25), Ishant Sharma (0/23) and Sandeep Sharma (1/35) bowled with tight line and length, giving no chance to Hyderabad openers Shikhar Dhawan and Warner to free their arms. With the frustration of not making the most of the Powerplay overs growing, Dhawan edged a high bouncer from medium pacer Mohit Sharma and wicket-keeper Wriddhiman Saha took a comfortable catch on the final ball of the fifth over, with Hyderabad at 25/1. New batsman in, Moises Henriques too struggled on a slow track as he played 15 deliveries, scoring nine runs before being stumped by Saha off a delivery from left-arm spinner Axar Patel, leaving Hyderabad at 50/2 in 9.2 overs. Axar dealt another blow in his next delivery by forcing an edge of Yuvraj Singh (0) to Saha. Warner, who was till then grinding out a 24-ball 20, was joined by Naman Ojha in the middle. Ojha decided to take the attack to the opposition and proved to be successful, especially against spinners Axar and K.C. Cariappa. During his 20-ball 34-run cameo, Ojha hit two fours and six to give some sort of thrust to the Hyderabad innings. The partnership between him and Warner provided 60 runs in just 6.1 overs. Warner mixed couple of fours with singles and twos to prop up the Hyderabad innings. But Cariappa got rid of Ojha as the batsman jumped down the track and completely missed the length only to be stumped by Saha. Warner continued to gather runs as he completed his 50 in 45 deliveries. But others continued to struggle at the other end. New batsman, Deepak Hooda (10) couldn't do much, while Afghan all-rounder Mohammad Nabi scored just two in the three deliveries he faced in his debut. Nabi's young compatriot, Rashid Khan plundered a six in the final ball of the 20th over to take Hyderabad to 159/6. During the chase, Punjab suffered a poor start as Bhuvneshwar Kumar plumbed Hashim Amla (1) in front of the wickets and removed Glenn Maxwell (10), who offered a catch to Warner at long-off, reducing the visitors to 16/2 in 2.5 overs. But Vohra's breezy knock helped them recover from it as he and Eoin Morgan (13) forged a 41-run partnership. Morgan's stay was however cut short as he was bowled by off-spinner Mohammed Nabi, leaving Punjab at 57/1 in 8.1 overs. In the next over, it was the turn of Rashid to deal a quick double blow as he castled David Miller (1) and Saha (0). Vohra continued to be impressive but wickets at the other end kept flowing. Henriques accounted for Axar (7) to put Hyderabad in command, reducing Punjab to 82/6 in 13.4 overs. Later, Vohra turned the heat on the hosts, hitting 20 runs in the 15th over bowled by Barinder Sran. He didn't stop there, going on to milk 21 run in the following over off Rashid. These two overs brought Punjab's total to 125/6. There was further drama to follow in the 17th over. While Bhuvneshwar got rid of Mohit (10), Dhawan dropped a catch at cover of Vohra. Vohra hammered another six in the following over of medium pacer Siddharth Kaul as he took his side just 16 runs away at the end of 18th over. Bhuvneshwar then hauled Hyderabad back in the 19th over by removing Cariappa (1) and rattling the stumps of Vohra, leaving Punjab to score 11 runs in the final over. Kaul gave couple of wides in the final over but held his nerve to bowl Ishant (2) and give Hyderabad a five-run win.